What kind of Vegetable Oil is that? "Virgin," "Extra Virgin," "Cold Pressed," "Expeller Pressed," "Saturated," "Monounsaturated," "Polyunsaturated," "Hydrogenated," etc... Are you confused yet? Let's examine these terms for any traces of meaning, particularly as they relate to biodiesel production. 1. The Hydraulic Press is the "oldest" method, uses the lowest technology, and produces arguably the best quality oil for human consumption. Like squeezing water from a mop, the hydraulic press compresses either cold or heated batches of seeds or vegetables into a smaller and smaller space, forcing their oil to escape through a screen or filter and leaving the dry pulp behind. 2. The Expeller Press uses a continuous process in which cooked vegetable material enters one end of a rotating screw mechanism that forces the material into tighter and tighter spaces, with oil escaping along the way until the dry pulp is finally ejected at the other end of the screw. 3. Solvent Extraction is the newest, highest technology, and most efficient of the three processes. Vegetable material is ground, cooked, and mixed with petroleum-based solvents to extract the oil, leaving a dry pulp. "Cold Pressed" typically refers to oil extracted by hydraulic press without adding heat to the vegetable material. Olive and sesame are the primary oils that can be extracted by cold pressing. Unfortunately, "cold pressed" has no legal definition, and is therefore subject to some creative marketing shenanigans. Most "pressed" vegetable oils, whether extracted by hydraulic press or expeller press, are heated, rather than cold pressed, allowing more oil to be extracted. "Virgin" and "Extra Virgin" typically refer to the first hydraulic pressing of olive oil (multiple pressings are typically used to get additional oil). These terms also have no legal definitions, so buyer beware. The typical marketing strategy for solvent extracted oil is not to mention how it was extracted! While the differences between these extraction techniques may be very important for oils consumed by humans, diesel engines are not so particular about how the vegetable oil was obtained. Biodiesel fuel from oil extracted by any of these methods will burn equally well in your diesel engine with one exception: In cold climates, biodiesel may gel, preventing it from passing freely from fuel tank to combustion chamber. To learn more about this problem, we need to investigate a chemical property of oil know as "saturation." First, it may be useful to note that the only difference between an oil and a fat is its melting temperature (or freezing temperature or "gel point" - all the same temperature, just different ways to look at it). Vegetable and animal oils and fats are classified as Saturated or Unsaturated. Saturated fats (such as lard) have higher gel points, and are typically solid at room temperature. Unsaturated oils are further divided into Monounsaturated and Polyunsaturated. These terms refer to the number of double-bonds in the fatty acid hydrocarbon chains which make up the oil. Monounsaturated oils such as olive have one double-bond per hydrocarbon chain, while polyunsaturated oils such as canola have multiple double-bonds. Hydrogenation is a process by which hydrogen atoms are added to unsaturated oils, converting them to saturated oils. The double bonds in unsaturated oil hydrocarbon chains are easily broken and converted to a single bond plus the attachment points for two additional hydrogen atoms. This process happens any time you use vegetable oil to cook foods that contain some water. That's one reason why fresh vegetable oil makes better biodiesel fuel than waste vegetable oil, at least for use in colder climates. Typically, the longer vegetable oil is used for cooking, the more saturated it becomes. Biodiesel made from saturated oils (whether they came from animal sources or from hydrogenated vegetable sources) gels at higher temperatures than biodiesel made from unsaturated oils. When the weather is hot, it doesn't matter whether your biodiesel gels at 40ºF or 30ºF, but even here in central Florida, there are winter days when biodiesel that gels at 40ºF will stop your car in its tracks. In addition to "gel point," another characteristic of concern to biodiesel users is "cloud point." This is the temperature at which the biodiesel begins to get "cloudy." The biodiesel remains liquid at this temperature, but suspended solids can clog fuel filters, potentially causing your engine to stop. 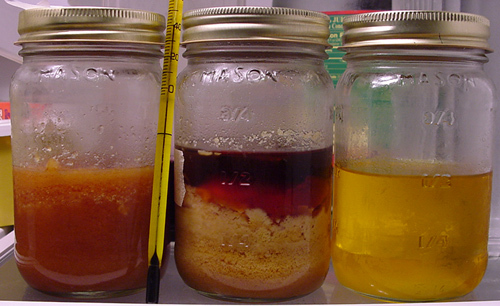 The photos below show some biodiesel samples that have been chilled to about 38ºF. You can see the extent to which each sample has gelled or clouded at this temperature. From a North Carolina distributor in September 2004 - Still liquid, but "cloudy"
of "cloudy" stuff in the right-hand jar. Also notice the small dark liquid layer that barely survives in the corner of the left-hand jar.